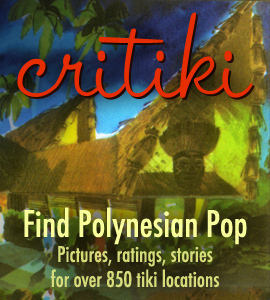 Need the perfect tiki wrapping paper to go with that perfect tiki gift you’ve found? How about some tiki Christmas cards? Sophista-tiki (a.k.a. Dawn Frasier) has been a fixture in the tiki art scene since before there was a tiki art scene. She’s conquered a variety of arenas: she paints, she makes aloha shirts, she makes handbags, she makes neckties, she makes party decorations, she makes rugs, and she has designed some outstanding fabric patterns… which are also available as wrapping paper, via Spoonflower. This year, she’s created a great new tapa-and-tikis design just for Christmas, available in red, green or white. A 26″x72″ roll of wrapping paper is $15. The same design is also used for her “Snappy Holidays” greeting cards, which have a little touch of silver glitter to really nail that mid-century holiday look. The greeting cards are available from Etsy in sets of three with 15 gift tags.